A QE old boy treated a group of Year 12 historians to an expert curator’s perspective when they visited the World War I centenary exhibition at the Imperial War Museum (IWM). 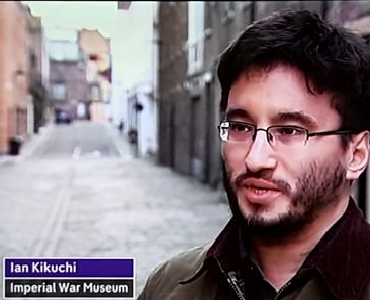 Ian Kikuchi (OE 1997-2004) is an historian at the museum who curated its exhibition commemorating the centenary of the Armistice. He took the boys on a tour of the exhibits and talked about his career and the IWM. The exhibition itself addressed the main issues of the war, from why it started, to what life was really like in the trenches, and the role of women. Mr Kikuchi, who took a BA in War Studies from King’s, answered questions after the tour. “The boys really enjoyed hearing how he progressed from working in the IWM’s HMS Belfast shop (while he was at university), to becoming the world expert on aspects of the war in Burma in World War II,” said Miss MacGregor.